The adjustable range of a pressure switch is also known as the working range of the switch. It is the pressure range a switch may see under normal working conditions. In the process of adjusting a pressure switch, accuracy and the service life could be compromised. 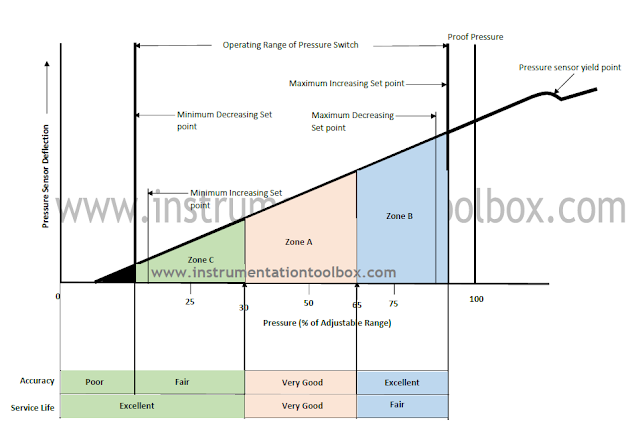 Efforts should therefore be made when adjusting a pressure switch to ensure that the desired accuracy can be achieved while at the same time ensuring that the switch lasts long by choosing the right adjustable or working range of the pressure switch. For the greatest accuracy, the set point of the pressure switch should be adjusted such that the set point fall in the upper 65% of the adjustable range. For a long service life, the switch set point should be adjusted to fall in the lower 65% of the adjustable range. The best combination of accuracy and long service life lies in the middle 30% of the adjustable range as shown above. This rule applies to diaphragm as well as bourdon tube pressure switches.